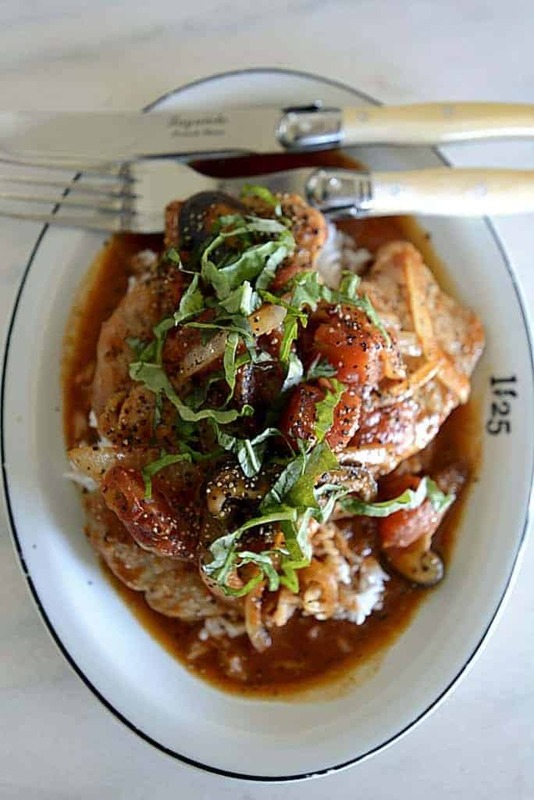 Smothered creole pork chops tomatoes & mushrooms! I mean that just sounds so amazing! 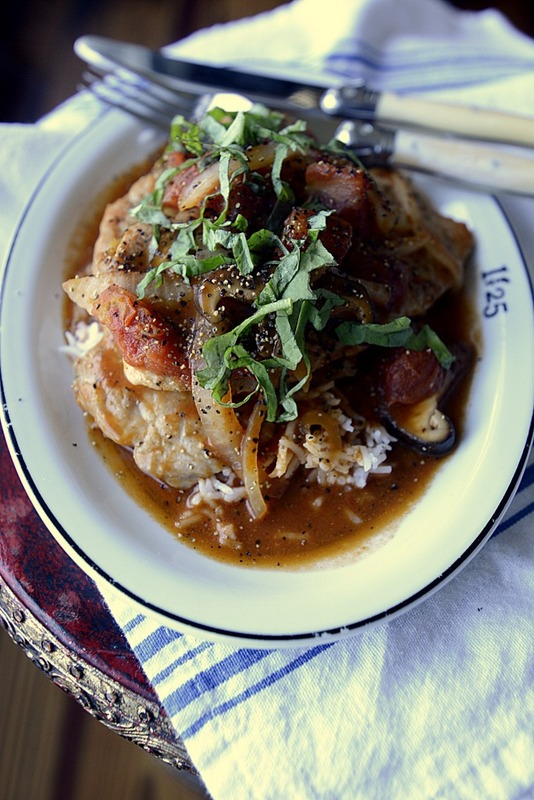 And, pork chop recipes can be super easy! If you think cooking is laborious, time-consuming and keeps you chained to the stove and kitchen, well, think again. I’m on a roll to show you and let you taste the proof that cooking at home can not only be simple and easy, but ‘most’ (I mean we do need a sweet here and there!) always healthy and delicious! 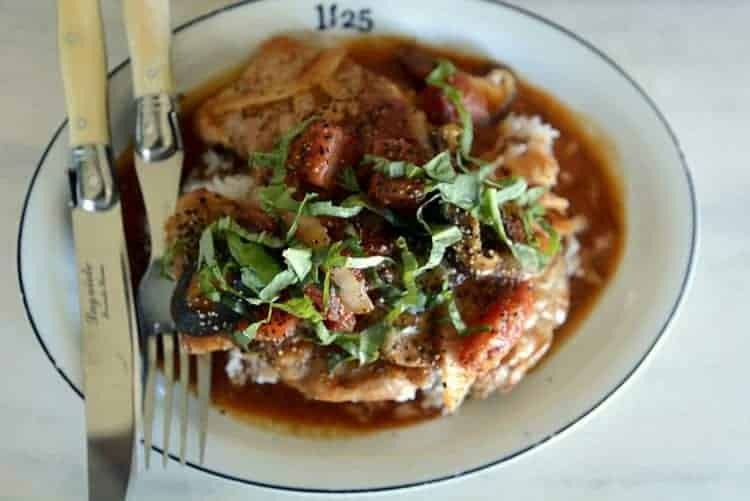 And, this recipe for smothered creole pork chops tomatoes & mushrooms will prove just how easy cooking can be! Get ready to see more Ally’s Kitchen’s recipes that focus on this stressless cooking! Yeah, we’re all busy. Doesn’t matter if you’re retired or working long hours during the week, we all seem to cut corners when it comes to hitting the kitchen after a long day’s activities. My goal is to create food that you can be chowing down on in less than an hour, but more like about under thirty minutes. Now, I know that’s a tall order to fill, but I believe it can be done. And, I want to do it because I want YOU to be healthy. I want YOU to get back in your kitchen. And, I want YOU to save some serious bucks by not eating out so much or calling for take out! So here are some ground rules for making this happen. Yes, you have to have some basics in order! You’re going to be using some convenience items in your cooking. I think I’m hearing a ‘hip hip hooooooray!’ Hold on! I’m not talking about those that aren’t good for you, but those that save time and that can be on the same level, healthwise, as doing it from scratch. To preserve the healthiness, buy the best products you can. Read the labels. Look for those that are organic and those that don’t have a lot of UNpronouncable words in the ingredients. I’m talking sauces, like marinara sauces, V8 and tomato juice, precooked rice, pasta, and mashed potatoes. Prepared sauce mixtures. Check out the produce area for precut and packaged vegetables. Yep, that’s going to save some prep time. Frozen vegetables and blends of vegetables are great. Canned tuna and chicken in water. Rotisserie chicken is a gold mine for several meals for one to two people and even a small family tribe. You need some basics in your spice drawer/cabinet/pantry. Definitely parchment paper in addition to plastic wrap, foil and some zip lock bags (different sizes). You want just a few basic spices and spice mixtures: salt, pepper (black and white), garlic granules, onion powder, Italian seasoning, Greek seasoning, ground cumin, red chili flakes, cinnamon, allspice, then find some spice mixtures that appeal to you, no-salt combinations from Mrs. Dash, McCormicks, Tony Cachere’s Original Creole Seasoning, Braggs Nutritional Yeast, Kirklands Signature No-Salt Seasoning, and other purveyors of spices. I love to keep stocked cans of mushrooms, tomatoes (chopped, whole, with green chiles, etc. ), beans (all varieties), liquid stocks (chicken, beef, vegetable, fish), canned tuna/chicken, canned Dole Sunshine fruits (in natural juices), olives (pitted, black and green), roasted red peppers, hummus, basil pesto, vinegar (white, balsamic, apple cider) then, of course, the other staples like flour, sugar, rice, pasta, a cake mix or two, condiments (mustard, ketchup, mayo, Worcestershire, etc.). Be sure you have oils, canola, cooking spray, extra virgin olive oil, coconut oil. Some much used things like sweet onions, fresh garlic, potatoes, tomatoes. Your refrigerator can house some frequently used items as well. Products that are versatile like sour cream, plain Greek yogurt, cream cheese. And, of course, some fresh veggies, like celery, bell peppers, greens, etc., fresh ginger, fresh herbs. 8 oz. fresh mushrooms, sliced, shitake, oyster, bella, etc. Heat the cast iron skillet (12+” diameter) on medium high. Mix the salt, pepper, yeast and creole seasoning in a small bowl. Use about half of the seasoning to coat the pork chops on both sides. Turn heat to medium. Add two tablespoons of oil. Put into the skillet and pan sear (cover while cooking) on each side about two and a half to three minutes. Remove chops to a plate. Stack the chops (they continue to cook) and cover with a lid or foil. Add the remaining oil to the skillet and sauté the mushrooms and onions about 2-3 minutes. Add the V8 juice, blend well then add the tomatoes. Add the chops to the mixture. Snuggle them in the tomato/onion/mushroom mixture. Cover, turn on medium low and let it cook a few minutes. Heat the rice in the microwave per directions. Serve the chops and tomato/mushroom mixture over rice. Garnish with fresh basil. Add a salad for greens! How about dessert after these great pork chops! Do you have to use the yeast? Love this dish! 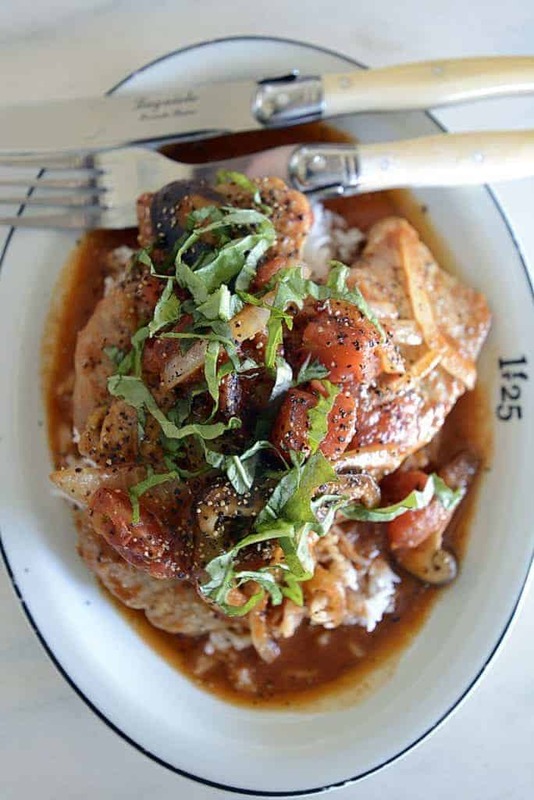 Huge fan of shrimp creole so I know I would enjoy this as well. Oh, Steve!! Thank you! It’s just so very simple and fabulously delicious! This sounds so dang good. Love it. Christine! Thanks, luv…maybe it’s just the simplicity of it, but we love love it!! Theresa! Thank you…it’s just super tasty! !